2 Jennifer is a found footage horror/comedy sequel to James Cullen Bressack’s 2013 film To Jennifer. The film is shot entirely on the iPhone 6, a style that is becoming increasingly more popular in indie film-making. I didn’t see the first film, but, from what I can gather, it is also a found footage horror/comedy shot on an iPhone. The original film follows Joey, who is determined to catch his girlfriend, Jennifer, in the act of cheating. The film turns disturbing, however, as Joey’s obsession with Jennifer leads down a dark path. Even though I didn’t see the first movie, I had no trouble following and enjoying the sequel. 2 Jennifer centers around a filmmaker named Spencer (Johnson) who enlists the help of his friend Mack (Coupe) to make the sequel to To Jennifer. They set out to find the perfect actress – who must be named Jennifer – in order to play the titular role. After a long and stressful casting session, they finally land on Jennifer Todd (Mummert), who Spencer claims is “the one.” The movie begins production as planned, but a sinister secret lurks under the surface, putting the lives of everyone involved in danger. This movie is riveting. From the very first scene to the very last, I couldn’t take my eyes off the screen. Honestly, I’m not even sure if words can describe how much I loved this movie. But, you know, it’s my job to at least try, right? 2 Jennifer instilled a very real sense of fear in me. It starts off lighthearted and fun as Spencer flies to Los Angeles and meets up with his friend Mack (who has two roommates named Dennis and Charlie – being from Philadelphia, I love a good Always Sunny reference). The movie slowly becomes more frightening, however, as we begin to see a darker side to Spencer. This shift in mood is done extremely well, aided by the clever pacing of the film as well as Hunter Johnson’s ability to switch between normal Spencer and psycho Spencer. The camera work is amazing. As I said in my review of The Visit, I have not had the best experiences with found footage movies. There’s always the risk that I’ll become motion sick. With this movie, however, there was no risk of that happening. The camera is handled extremely well; nice and steady (I did feel nauseated when it was over, but I can assure you that it was for a completely different reason). The shots are brilliant, too. They allow for the audience to really get into Spencer’s head, which creates an unparalleled amount of suspense. The acting in this movie was some of the best I’ve seen in a long time. Johnson takes terrifying to a new level with his dead stares and monotone voice. It’s a stark contrast to the happy-go-lucky attitude he wears during most of the movie. David Coupe plays an amazing foil character. He’s level headed, responsible and always tries to make sure that everything is going according to plan. Mack balances Spencer out, making them a great filmmaking team, which translates well on camera. Finally, Lara Jean Mummert, the beautiful Jennifer, captures the role and delivers nothing but perfection. It’s not often you see a horror movie heroine with such a believable scream. Yes. Yes, I do. 2 Jennifer left me feeling sick, which is the sign of good horror. In fact, I had to walk around my apartment until my heart calmed down before I could even sit to write this review. I want to say more, but I’m afraid I’ll give away something I shouldn’t. I don’t want to ruin it for you all. 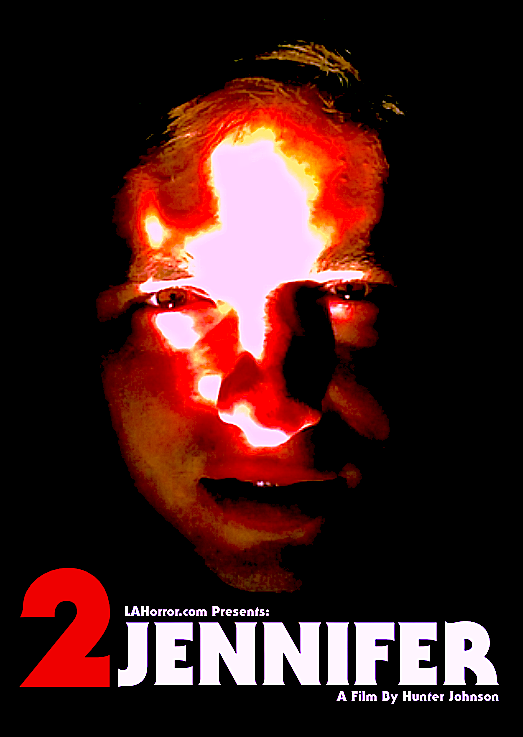 2 Jennifer is a LAHorror.com original movie. It is not currently available to the public and the release date is still TBD, however, it is the hope of LAHorror.com that this film will follow in the footsteps of the original and be released on DVD. For more information about 2 Jennifer, as well as updates in regards to its release, please visit LAHorror.com. This entry was posted on November 13, 2015 at 8:00 pm and is filed under Review with tags 2 Jennifer, found footage horror, Horror, indie films, Indie Horror, lahorror.com, sequel, to jennifer. You can follow any responses to this entry through the RSS 2.0 feed. You can leave a response, or trackback from your own site.